Marchand Petit have taken steps towards improving their environmental impact by beginning to change in-house magazines and advertising to eco-friendly uncoated 100% recyclable paper. Starting in January 2018 with the Marchand Petit Review Magazine, over the past 12 months the Company have continued to take steps to remove plastic coatings from their single-use advertising products. 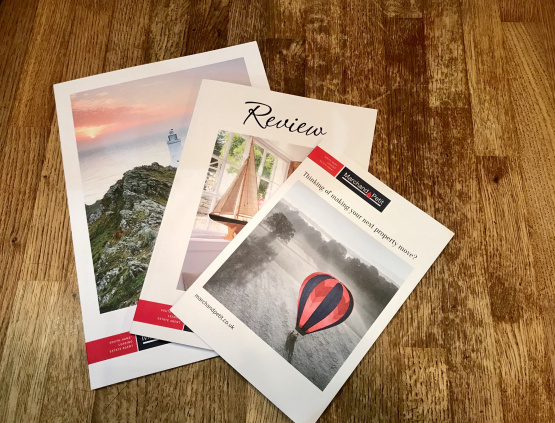 During this time the Company has produced a new look ‘At Home Magazine’ which in October received its new chic uncoated paper finish, followed by Simply South Hams Magazine in March 2019, which will also be swapping its trademark glossy finish for a new stylish uncoated look to join the suite of magazines. More than just the magazines, in December 2018 the company introduced uncoated advertising mailers which are also fully recyclable, unlike the previous style which had a plastic coating. The change came as a result of the world-wide problem with plastic pollution and a customer suggestion. As a brand Marchand Petit are always keen to remain innovative, conscious of the surroundings and customer feedback and they hope the new look marketing will be well received. “I am delighted with our new range of environmentally friendly print products. As a company based in South Hams, surrounded by coast and countryside the environment is very important to us. Reducing the plastic coatings on our marketing material will help us become more conscious as a company about our use of plastic.